Planning a family camping vacation? Keep your kids happy after a long day of exploring the outdoors with some fun family-friendly campfire recipes. All you’ll need are the ingredients and Rolla Roasters, the original marshmallow toasting forks, to make your family’s camp cooking experience one to remember. Cut one end of the hot dog eight times lengthwise while leaving the other end uncut. After you’re done you will have eight “octopus legs” and an uncut head. 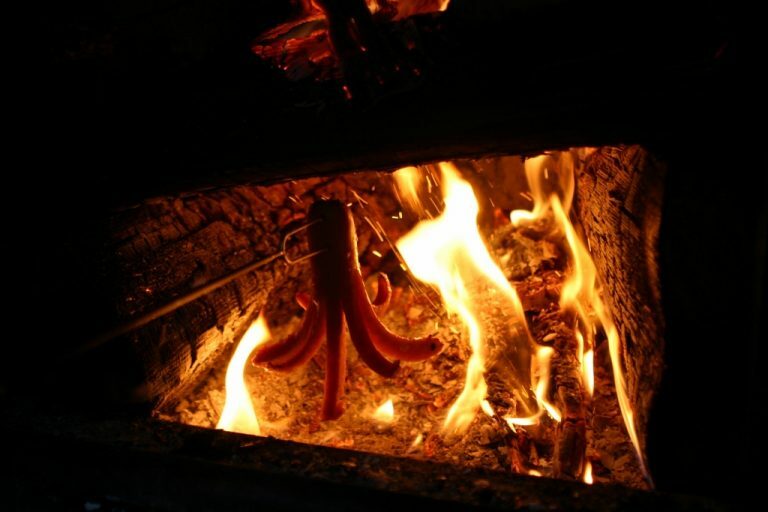 Stick the wiener onto a Rolla Roster and toast over the coals until the ends curl up like the tentacles of an octopus. Mash a banana with a fork on one half of a tortilla then cover with the chocolate chips. Roll into a log-shape and stick onto the end of a Rolla Roaster. Lightly toast over the campfire. (You can also use rehydrated freeze-dried bananas to lighten the load and decrease the potential for messy bananas). Mix 1/2 tsp of sugar into 1/2 c warm water then add the yeast and let it sit for a few minutes until it becomes frothy and bubbly. Combine all of the ingredients in the freezer bag and knead the dough for about five minutes. (Make sure to remove all the air from the bag and seal it tightly). The dough is ready when the ingredients are all combined and it feels elastic. Divide into four equal pieces and roll into snake-like pieces. Wrap each “snake” around the end of a Rolla Roaster and use the cranberries/cherries for eyes by pressing firmly into the dough. Bake over the coals for 10 to 15 minutes. When the “snakes” are golden remove them from the fire, butter them and sprinkle them with the sugar. Recipes adapted from A Fork in the Trail by Laurie Ann March. Please visit www.RollaRoaster.com to order your marshmallow and hot dog toasting forks. 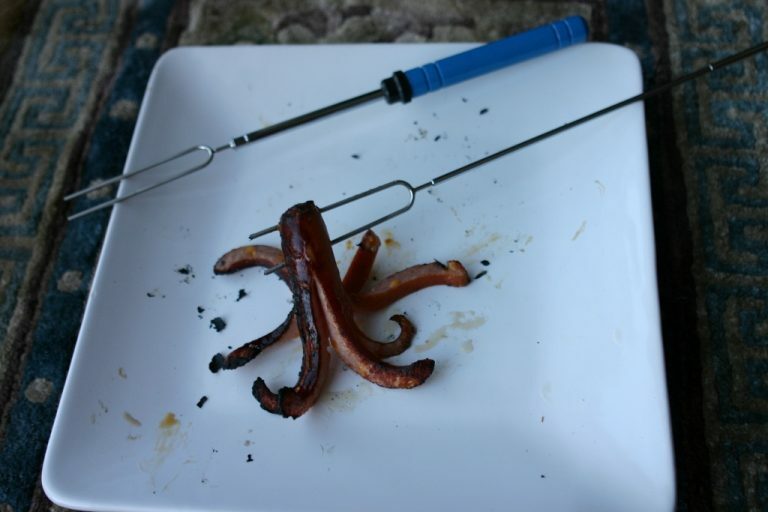 Posted in Campfire Cooking and tagged barbeque forks, campfire cooking, campfires, family camping, kids, marshmallow toasting forks, octopus weiners, outdoor cooking, sugar snake bread, toasted banana wrap.